Our group chose this cruise unanimously in spite to the fact that at least 6 of the 26 of us had been through the Panama Canal on a cruise before. We had excellent cabin and dining staff. Brilliant Entertainment! The dining menus were up to par as we had experienced on the previous 4 cruises our group had taken on Holland America. The food quality in the Main dining room and in the Lido restaurant was very very good. Our group evening at the Pinnacle Grille was exceptional. The staff on the ship were exceptionally courteous and helpful. One of the very high points was the classical pianist, Hyperion Knight, who entertained us. His on stage work was enthralling but the real cherry was the "practice sessions" he had in The Explorers&apos;s Lounge. My wife and I happened on him one morning early in the cruise in the lounge playing the piano. There were only 3 other couples in there at the time and we sat through what turned out to be a "private" concert. He played (without sheet music) for and hour and a half almost continuously and his music had us entranced. He was very personable as he chatted with us and talked about his music. This happenstance became more widely known as the cruise progressed and what started out as a concert for 6 persons became a "practice" session to a full lounge to another day with standing room only to having to be there half an hour ahead of his impromptu unscheduled sessions. He was also a fun participant in the twice a day Trivia sessions. His trivia knowledge is formidable and it was great fun playing with and against his teams. At the end of the cruise everyone of our group were expressing how much they enjoyed this trip and were asking when we would be planning the next one. For a bunch of 75 year old high school pals it was a great time. Our group chose this cruise unanimously in spite to the fact that at least 6 of the 26 of us had been through the Panama Canal on a cruise before. We had excellent cabin and dining staff. Brilliant Entertainment! 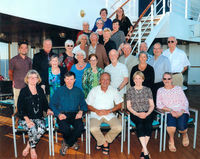 The dining menus were up to par as we had experienced on the previous 4 cruises our group had taken on Holland America. The food quality in the Main dining room and in the Lido restaurant was very very good. Our group evening at the Pinnacle Grille was exceptional. The staff on the ship were exceptionally courteous and helpful. One of the very high points was the classical pianist, Hyperion Knight, who entertained us. His on stage work was enthralling but the real cherry was the "practice sessions" he had in The Explorers&apos;s Lounge. My wife and I happened on him one morning early in the cruise in the lounge playing the piano. There were only 3 other couples in there at the time and we sat through what turned out to be a "private" concert. He played (without sheet music) for and hour and a half almost continuously and his music had us entranced. He was very personable as he chatted with us and talked about his music. This happenstance became more widely known as the cruise progressed and what started out as a concert for 6 persons became a "practice" session to a full lounge to another day with standing room only to having to be there half an hour ahead of his impromptu unscheduled sessions. He was also a fun participant in the twice a day Trivia sessions. His trivia knowledge is formidable and it was great fun playing with and against his teams. At the end of the cruise everyone of our group were expressing how much they enjoyed this trip and were asking when we would be planning the next one. For a bunch of 75 year old high school pals it was a great time. This was a handicapped friendly cabin and it made time in our stateroom for my handicapped wife and I very comfortable. We prefer cabins high up on the stern as they offer a wide view of where we have been. We don&apos;t miss out on what goes on on the other side of the ship and we get to relax with a longer time view of beautiful locations. The stewards were outstanding in their care of our needs and the condition of the Stateroom. The facilities in the cabin were perfect for our needs. The equestrian tour was better than anticipated. We stayede at the Riverside hotel in Ft Lauderdale (again) and it lived up to our previous excellent experience. The staff were great and the Bellman services exceeded our expectations. Stayed aboard and should have gone ashore with others. My wife&apos;s handicapped precludes much walking about. Others said that it was a delightful location. Stayed on board. Have been to Guatemala before and took the Tikal tour that time. It was probably the best tour taken over all the cruises but the cost has risen from $450 to $650 which is a bit too rich to do again. Not a Puerto Vallarta fan having visited it before and not impressed with the tour we took that time. Too much emphasis on getting the participants to shop. The day on board was very pleasant. Enjoyed the trip on the river. Would have liked to see more of the bird life to go with the crocodiles.